Karen deserves high appreciation for her work creating helpful videos. Lately, she has been creating the Data Doctor instructional videos, announced here by Sheryl Moore. Creating help materials is a LOT of work, creative work, and a generally thankless job. So many people are helped by it, but most never think to credit the ones that created that help. Most of us only notice the imperfections, if any. Karen has a really nice voice, and a great attitude, a perfect person for the creative work she is doing! Thank you Karen! I'm so forgetful! I should also have remembered to thank you for all the work you do doctoring sick data! Rob, Susan, Shaun and all. You've got me blushing. I love making videos because it combines so many of my interests. The fact that the videos have such a great purpose is icing on the cake. CONGRATULATIONS Karen! 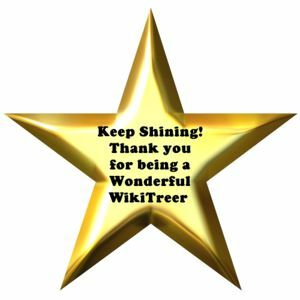 Thank you for all that you do on Wikitree, You are a Star! Thank you, Rob, for honoring a Great member! Thank you for recognizing her - she works hard on the videos and will appreciate your comments. Any relation to Mathide Michaud of Grand Falls who married Anthony Marshall. Thanks to Stu Light for his assistance. Calling all Huey's Hughey's Howie's Hoy's Hewey's who have DNA tested...!! Is your heart warm enough to adopt Icy Rigdon? Does anyone know anything about Hoy Helburn Arnett (female) born in Ohio 10-20-1953 to Glen Arnett and Hazel Lee Erwin?